I found you just as a fluke! Here in London recovering after an heart attack,just nothing!!! I am an italian music lover....poet,rock archivist...see my page www.myspace.com/zenlo and my 4 Poetry Blogs. Your Work 'Conversation with the heart'is strangely appropriate to my case,and I would be on cloud nine if you'll kindly send me a copy of that. Many thanks from the bottom of my red transistor. PS Van Dyke Parks that graces your songs knows me.I met him here in town,and months ago we exchanged messages on line.Wow! Hi to all and especially to Terrea who may remember me from "Nino and Miguel" and "Mike and Larry". Stephanie and I have been married 44 years and have traveled the world working as social workers in Alaska, Germany and New Mexico. We are retired and enjoying the Southwest. 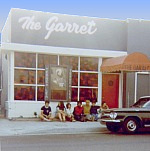 I will never forget the fun and good times at the Garret. The Garrett was used as a filming location for the 1960 film "The High Powered Rifle". They spent one day filming some scenes with its stars Allison Hayes and Dan Simmons. Terrea Lea was also in the film, which seems to have disappeared. Even its producer-director Maury Dexter doesn't have a copy. Thanks to Terrea for letting me know her thoughts on the movie! If it ever shows up....I hope we all get to see it! I was reading some messages from people who knew my father back in the 60's. Phil Campos. I put together a website with some pictures, video and audio. If anyone has anything they can contribute, It would mean the world to me. I am greatly saddened to report that Sue Tjulander passed away today after suffering a massive stroke. I was a frequent visitor to the Garret in the late 50s and early 60s. I always loved Terrea Lea's music and followed the "Folk" scene in LA during that period. I was a huge Bud and Trav fan. I always remembered that damned Espresso machind drowning out the music with regularity. Nice to find this site and the memories. Holy Sh*t! I can't believe The Garret and Terrea Lea are still there. I just came across a Terrea Lea album that I bought in the 60's when I went on dates to The Garret. That was 1964! Wow!!! Your mother Renee and your Father Phil sang at Nippersink when we first met. Your mother sang at my sons BarMitzvah. We live in Las Vegas and also saw her at the temple where she sang. We would like very much to get in touch with her. My father passed away when i was 2 yrs old. i never got to know him all that well. I am the youngest son of Phil Campos.. Its great to hear about this place from my mother Renee Campos(Nole) just google searched it.. its great to see these types of places continuing on.. Thank you for remembering my father..
hope you are doing well. i thought you would get a kick out of my story. my mother was in so. calif in 1954 and still hadn't picked out a name for her newborn. she and her sister went and saw you perform and my mom thought your name was so pretty,she named me for you. i just found your cd and enjoyed your music tremendously! Thanks so much for this page. I spent my early guitar years at the Garret hoping to play one song and did many times. I have been a touring professional entertainer since 1970 and Terrea Lea was one of my early inspirations. I still play "When the World was Young." I also still have my Red Vinyl album with Terrea's signature on the back, signed June 1961. What a great walk for me down memory lane. Thanks so much for providing the pics, memories, and all the other stuff. My love to Terrea and My thanks to all who came to the Garret.. 1960-1964. I still play about 10 or so Bud and Travis tunes too but mostly comedy now. How wonderful to find something so dear to my past! Amazing. Thanks for being here! Wish it were here today. Fooey with Starbucks, the Garret was the real coffee house! The Garret was my home away from home. I loved it! I was so sad when it closed. My best memories are of taking different friends to The Garret. Thanks for everything. Just a note to say how are you doing? I see a note from Jo Mapes..I remember her from a folksong cafe in Washington, DC in 1963..she sang "The San Francisco Bay Blues" it was the first time I ever heard that tune and was blown completely away..it was the inspiration for me to start a club in Rochester, NY in 1969. Where is Jo Mapes today?